New Conglomerate infantry move under the concealment provided by smoke grenades between cover during a firefight against the Vanu Sovereignty. 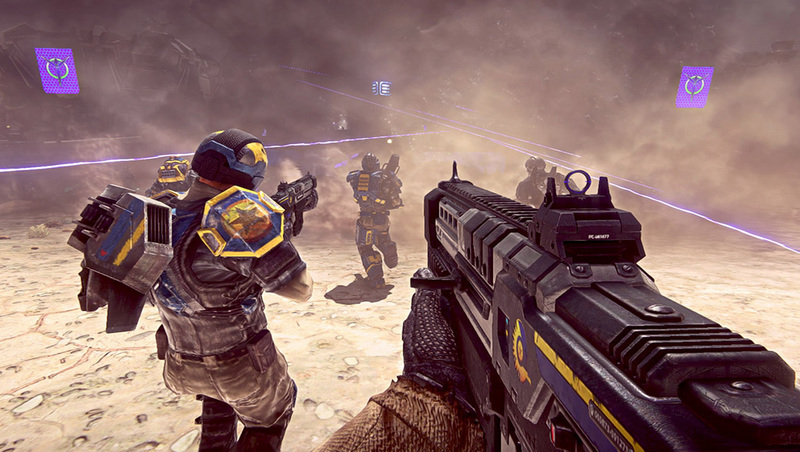 The use of team tactics such as smoke concealment are what set Planetside 2 apart from a lot of other first person shooters. 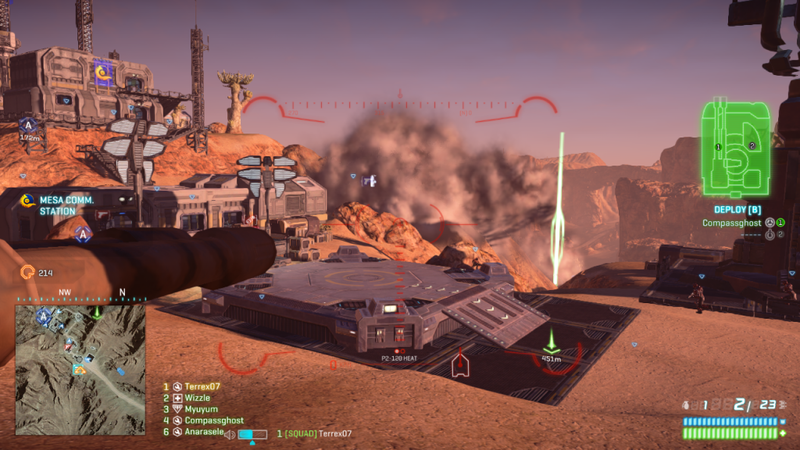 In Planetside 2 smoke is a highly under-utilized and misunderstood tool. Smoke provides concealment and can provide distraction. Most don’t know how to use either effectively. There are many guides about smoke and its uses in Planetside 2, but every single one of them focuses the effort on using it for killwhore tactics and using it as an individual. Not a single guide went further than mentioning team-based uses for smoke. So here is more than just a mention on team-based uses for smoke. Smoke provides concealment. Concealment allows a player or group of players to move without the enemy seeing their movement directly. Placing smoke between the moving players and the enemy will make any fires at the moving group highly ineffective. Smoke breaks lock-ons. The locking weapon cannot see the target and therefore loses its lock. A pretty simple mechanic as seen with IR Smoke on ground vehicles. The underbarrel smoke grenade launchers and light assault smoke grenades have the same effect. Thermal sights can see through smoke. Equip thermal sights to a vehicle or your infantry primary weapon and pop smoke and shoot your now blind enemy enveloped in smoke. Underbarrel smoke grenade launchers are ideal for this tactic because they do not use resources and can be reloaded from an ammo pack. Some units cannot equip thermal sights and therefore are rendered completely blind 100% of the time. MAX units are one such unit. So remember: shoot smoke at the next enemy MAX crash to render them blind. Smoke can act as a distraction. Let’s face it, gamers are prone to tunnel vision. We see something like a massive smoke cloud and we all have to look at it because there has to be something going on there… WRONG! I had my engineers build a massive smoke cloud to get your attention while the rest of my platoon slips in the backdoor uncontested! While smoke employed by an individual can help, it can also hinder friendlies in the vicinity of that individual if they are unprepared. Smoke is definitely a double-edged sword so take the following considerations into account before popping smoke. Will it give the enemy more of an advantage than friendlies? This is the big one. A great example is spawn camping. Unless the majority of offensive spawn campers have thermal sights equipped, the defenders (players that are respawning) will have the advantage because it mitigates the bottleneck and fatal funnel that the few exits of the spawn room create. They can exit the spawn room exits without taking precision fire from the spawn campers and then move through the smoke. Are friendlies in the area prepared? If they aren’t then don’t pop it, yet. Fixing this is as simple as putting the heads up in /re chat (Region Chat) to include the purpose of the smoke. There have been many cases of team killing of a player that was providing smoke suppression because the friendlies weren’t aware of why he was doing it. Smoke has made this Prowler blind to its target. Who knows what is happening in that cloud of smoke! The next step is to pick where to put the smoke. If using it for masking purposes, there are three logical locations in most situations and your situation will partially determine where you will put the smoke. At the position of the friendlies being masked. This masks them from observation and fires from all directions but also blinds the friendly unit. They also cannot move without losing the masking effect of the smoke. This is excellent for a ninja retreat – drop smoke, exfiltrate and hopefully when the smoke clears, you are gone and the enemy is left scratching their heads. Between the enemy and the unit being masked. Depending on the terrain, this may not be possible. This method can be used to bait the enemy out of a fortified position into a position that is susceptible to a friendly unit’s fire by denying the enemy the ability to effectively shoot from their fortified position. It can also be used to mask the friendly unit’s movement. This is ideal for masking forward or lateral movements across a battlefield. Pop smoke between yourself and the enemies and advance to your next piece of cover. When the smoke clears, if they didn’t see you, they will expect you to be where you were, giving you a slight element of surprise. At the position of the enemy. While this method may seem the most suitable because the enemy will be completely blind, it causes the enemy to rapidly disperse the vicinity of the smoke. This can be used to force the enemy out of an advantageous position. If the enemy can lay down superior firepower, this is an excellent choice. If the majority of your squad has the NV scopes on their weapons, another great use of this positioning is when breaching a building – fill the building with smoke and go in guns blazing. The enemy won’t be able to see any of you (unless they happen to have the NV Scope). In closing, smoke is highly underutilized mainly because its usefulness is not understood by the majority of players. Most that do understand it though, do not have the necessary teammates to use it with and as a result it is seen used as a toy in the warpgates and by solo players who attempt to use it on an individual basis, typically in close quarters. Hopefully a few good players read this guide and share it with their friends and start using the very simple tactics outlined in this article to their advantage! What are some cases where you have effectively used smoke in Planetside 2?